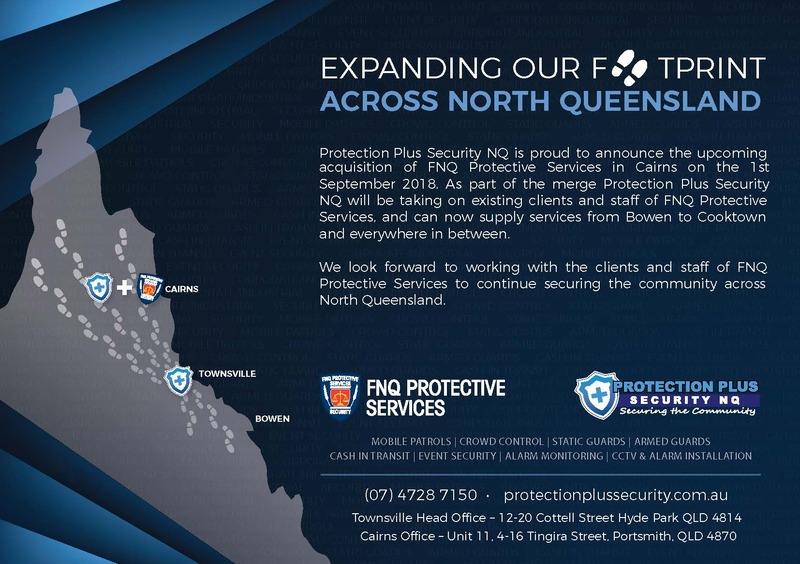 Protection Plus Security NQ is proud to announce the upcoming acquisition of FNQ Protective Services in Cairns North Queensland on the 1st September 2018. This is a wonderful development for our business and FNQ Protective Services. Protection Plus Security NQ is a North Queensland locally owned and operated Company, with our Head Office located in Townsville. The Director and Management Team have over 25 years combined experience in the local Security Industry, and we are confident that we can continue to provide you with cost effective and quality security services to meet your needs. Our Cairns Security Branch Located at 11, 4-16 Tingra street, Portsmith Cairns now offers a complete rang of Security Manpower Services. This include Security Patrols, Alarm Responses, Static Guarding, Event Security, Banking & Valuable Collections, Alarm Installation & Monitoring and CCTV installations.